Two items of cultural interest to Nessie followers have recently come to my attention. 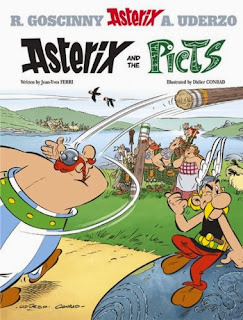 Firstly, "Asterix and the Picts" has been published and as you may guess from the title, the indomitable Gaul is heading north to the Highlands. And, yes, he meets the Loch Ness Monster on his travels. This is no surprise as the Picts were the indigenous people around Loch Ness during the time of the Romans. However, an appearance by Saint Columba is unlikely as Asterix predates him by over 500 years! 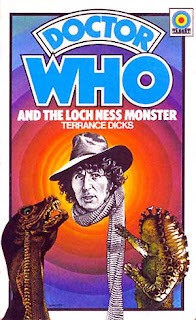 Unlike Columba's man-killer, and going by this image I found via google, the publishers have gone for a blue, docile Nessie. Well, it is aimed at a younger audience. I was a fan of the Asterix books in my youth and hope to get my hands on this book soon. Talking of my mis-spent youth, the next item to recently go on sale is a DVD release of the Doctor Who's "Terror of the Zygons". Broadcast in 1975, it pits the Doctor against an alien race which feeds of a pet cyborg called the Skarasen (Nessie to us). This Loch Ness Monster is not so blue and not so docile as it goes on a trail of destruction. I watched this as a kid but the memory of it has long faded. Apparently, the Loch Ness Monster was a bit of a flop in terms of special effects, though I doubt I would have been complaining as a 1970s kid. One suspects it got the scrag end of the production budget but the story itself is first class. Again, I hope to see this in my possession soon as some nostalgia is indulged in. This story was broadcast over September 1975, a mere three months before the famous Rines underwater photographs reached a peak of media frenzy. 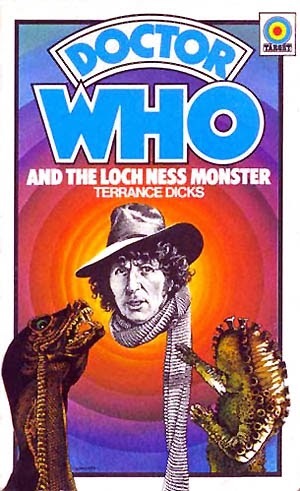 In fact, the Loch Ness Monster was on such a high, that when Target Books published the story as a paperback the following January, it was the alien pet that usurped the alien owners as the title was changed to "Doctor Who and the Loch Ness Monster"! The BBC trying to cash in on Nessie fever? Surely not! By some coincidence, this is also the 50th anniversary of the Doctor Who phenomenon and the Zygons will be featuring in the anniversary episode on the 23rd November. There is no word either way on whether their pet cyborg will be making an appearance. I think they ought to as recompense for the poor rendition of 1975! Talking of 1970s recession TV from the BBC, I really ought to end with that other Nessie appearance contrived by them in 1971 with that other great series "The Goodies". Whilst hunting for haggis and tackling a venomous bagpipe spider, our favourite cryptid appears - or does he? Regular reader, Ed, sent me this link which I thought was worthy of inclusion. In the manner of our recent video clip of a witness to a strange sight in Findhorn Bay, we have here an account of a Loch Ness Monster sighting from July 1933 by the witness recorded in April 2013! Margaret Aitken, was recorded by her grandson, Willie. She tells of how she was out on a Sunday afternoon car trip on the Dores road with her boyfriend that summer eighty years ago, when they were flagged down by a couple. They were told they had just seen the monster playing in the water but when they looked out all they saw was a wash and a splash. Their luck was in though as the familiar form of the upturned boat arose from the water and then headed off in the direction of Urquhart Castle. Listen to Margaret herself as she recounts her tale below. Amazing, and all this a mere two or three months into the modern era of Nessie! At the time of the recording, Margaret must have held the record as a witness to the oldest report of the Loch Ness Monster. In the video, Margaret is 97 years old, also making her a contender for the oldest Nessie witness. I had a look at the sightings record and see no mention of this report in the literature or newspapers with her name or at that location in July 1933. So it seems new sightings of the monster can turn up even eighty years after the event! One wonders how many others like this went unreported during those incredible years of 1933-34?